A midnight movie is not just a film shown at midnight. Bridget Jones’ Diary shown at midnight would not be a midnight movie. Neither would a midnight screening of Time Regained – not unless the crowd were told to speak in French and to bash a teaspoon against a teacup when a compere gave the cue. From its origins in 1950s America, the midnight movie slot has always been given over to low-budget, horror and trash. Top scores if the film is all three. 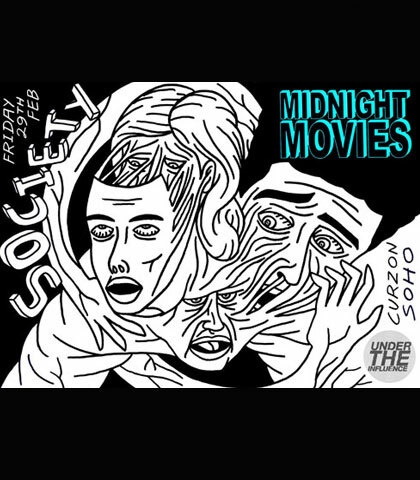 Rather like the graveyard shift on radio, the midnight movie slot is meant for the niche or risqué stuff admired by nighthawks, insomniacs and the downright crazy. The midnight movie concept was dead by the mid-80s. Until then late-night movie-goers had been able to feast on the horrors and delights of films such as Alejandro Jodorowsky’s El Topo and John Waters’ Pink Flamingos, going back time and time again for more. But things changed when the big studios saw the midnight screenings as an effective marketing tool and tried to reverse the bottom-up creation of cult films by releasing their movies at midnight in the hope of attracting an audience as loyal as the fans of The Rocky Horror Picture Show, for example. Rocky is perhaps the most famous and persistent example of the midnight movie, its fans still meeting at cinemas the world over to watch a midnight screening and act out scenes from the film. Their crude and irreverent heckling of the characters in the film often reaches anarchic proportions and, as any visitor to a Rocky event can tell you, makes for a damn good night. It is this spirit of fun and spontaneity that inspired the folk at Curzon Soho to bring back the midnight movie. But rather than show just the old classics, the events team hope to screen all kinds of films that reflect the spirit of the midnight movie. ‘We wanted to put on a night that people wandering around Soho after a few drinks could come to and enjoy. The first two screenings are of US films but we want to move away from just that and start showing European films, for example, which still have that gritty, grimy feel to them’, said Simon Howarth of Curzon. Their first offering, Society, hit the right spot. Gory, dark and camp in equal measure, the film’s 1980s styling and casting of Baywatch goodie-goodie Billy Warlock lend it an added veneer of trash. By most people’s standards it is not a good movie and at any other screening could be justifiedly panned. But it is just right for the midnight slot, which turns its shortcomings into merits. As a prelude to the screening the Curzon’s main bar area was given over to a party complete with free beer (well, one free beer per head) and hosts and hostesses dressed up like zombies. The dark 80s tunes, such as the theme from Twin Peaks, provided a suitable soundtrack to the revelling of cinema-goers who had been able to leisurely make their way to the Curzon and who were enjoying meeting and greeting other midnight film buffs. With bums on cinema seats, author of The Cult Film Reader and director of the Cult Film Archive Xavier Mendik introduced the screening, explaining how Society showed the ruptures in the Reaganesque Conservatism of the 1980s in the US. It was interesting and informed but it was not quite the right time for that kind of talk. The crowd was loose and ready to heckle. They were obviously discerning film fans, and would have been interested in what Xavier had to say if it had been earlier that day or when the hangover subsided the next. But having him speak then was a bit like casting Laurence Olivier in a Carry On film. There were a few guilt-riddled heckles and some whoops and cheers but a quirkier, cheekier kind of compere would have been better suited to the mood of the audience. Statuesque and matronesque glamster Dolly Rocket of the Flash Monkey burlesque club came to mind as an ideal candidate. Or Vampira. But compere queries aside, the return of Midnight Movies captured the spirit of the original phenomenon. It has obviously struck a chord with Londoners who were so eager to reserve for the next event (a screening of the Grindhouse Double Bill in its full glory) that an extra screening has been announced. Now we just have to sit back and wait for Odeon and Cineworld to announce that they are doing the same. What a great article indeed! I would just like to say that there is nothing grimy about Curzon Soho, that’s for sure! Especially not now with its wonderful new carpet!